A few months back, held in the quirky Marvel Comic-themed cafe Hungry Heroes, ECCO launched its anticipated Spring /Summer 2015 offerings which is inspired after Scandinavia's gorgeous landscapes and idyllic waters, majestic sand dunes and natural foliage. I first learnt about the brand as its one of my mom's go to footwear brands and so this was great timing to check it out. The ECCO Damara range is the epitome of understated, effortless chic with slouchy shapes and a minimalistic lines. The basic pastels shades of dove grey, lilac and blues make it easy staples to have in your fashion arsenal. 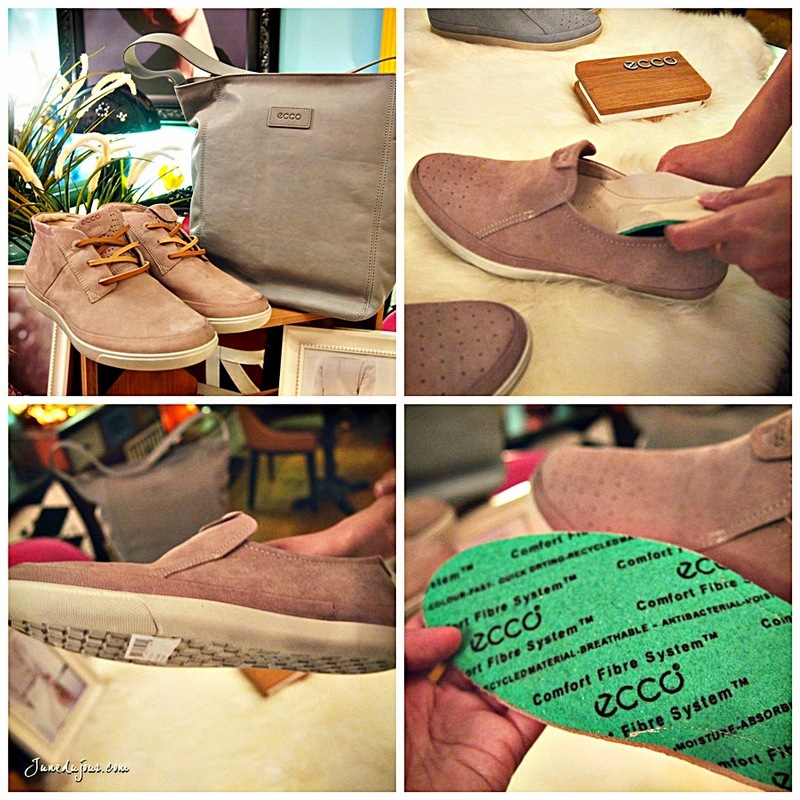 Most of the shoes are made of leather, Poliyou®, or a combination of leather and textile; which is specially created by ECCO to promote improved foot comfort and air circulation. This multi-tasking, recyclable material not only neutralises the bacteria caused by trapped moisture, it also reducing bad odour; as well as packs shock-absorption to protect the lumbar region, coccyx and spinal column. This pillowy material contours the foot when walking,and remains durable enough to withstand any misshaping due to regular use. And the discerning gentlemen on the go can look forward to some great sartorial additions: ECCO firdlay for work, ECCO Derio Messenger and ECCO Gary. Love the stitching detail on the classic lines of men's range. No compromising style for sheer comfort, I envision these would be perfect for our sunny climate. 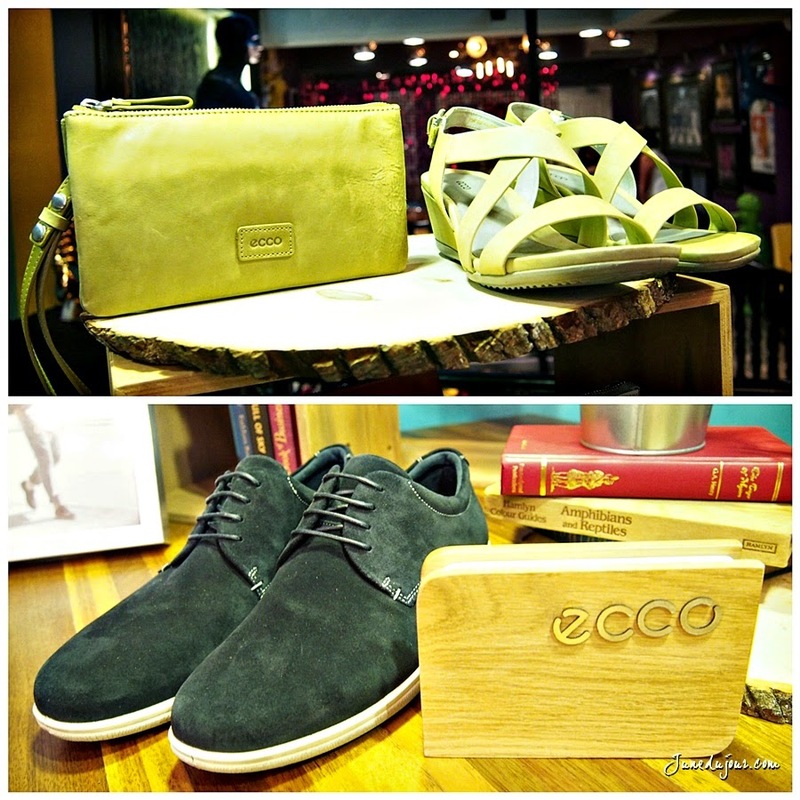 Its interesting to know ECCO has its own selection of products to rejuvenate and care for smooth leather, nubuck, oiled nubuck and suede. These included cleansers to gently remove grime without damaging the material, add shine as well as to waterproof even, with their universal waterproofing spray. Interupting this fashion report to deliver a PSA: The lamb shanks by Hungry Heroes are THE BOMB. Seriously, if you haven't tried them yet, you REALLY need to immediately. What was truly impressive to me is its GORETEX technology which is created to keep feet cool, dry and comfortable even during hot weather; this ECCO O2 range combines cutting edge GORETEX® technologies with signature ECCO elements such as its premium-quality yak leathers. Inside, a 100% waterproof membrane is layered into leather uppers / laminated to textiles inside the upper, before carefully sealed. Visible venting holes in the entire outsole (pictured in red below) coupled with micro-perforated yak leather enhances airflow to allow further breathability, and reduces weight and ensures glove-like fit. This is a shoe that is truly versatile for both sunny and rainy days (trust me, I wore it while jumping into a tank of water available onhand), without nary an iota of feet discomfort! Thank you ECCO team for having me! The ECCO Damara range is already retailing at all ECCO stores; where as the ECCO O2 range will be in store in March and the Dress Comfort range will be in store in April.